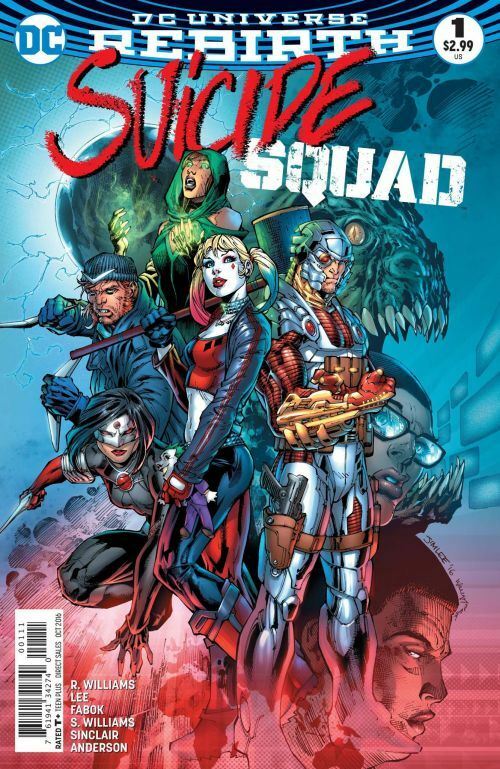 The Suicide Squad begin the first mission of their new series in issue 1, and it doesn’t even take half the comic before things start to go wrong. Williams, Lee and Williams herald what sure feels like a return to greatness with this debut issue. The line-up largely matches that of the movie. Amanda Waller has Rick Flag, with Katana as his second in command, take out a group of super-villains to Russia to find out more about a mysterious “cosmic item” that has fallen into their hands. Deadshot, Harley Quinn, Captain Boomerang, the Enchantress and Killer Croc, all with bombs implanted into them, are air dropped, along with Flag and Katana. We don’t even have to wait for the team to land before chaos erupts and the situation takes a deadly turn. Entertainingly, the problem is caused by Killer Croc’s digestive system, rather than by any intentional sabotage. Jim Lee is perfectly able to render clean and beautiful art, but that is not what is called for in Suicide Squad, and that is not what we get. Instead, he and Williams provide some dirty, gritty renderings that more appropriately suit this title. It’s a very fast moving lead story, which grabs the reader and doesn’t let them go. The issue also has an excellent back-up solo tale for Deadshot, far better than the story arc he was given recently in Suicide Squad Most Wanted. Williams is joined by Jason Fabok for this tale, which show how such a deadly assassin, who never misses his target, wound up getting captured by Batman. The story makes a nod to the original origin of Deadshot, his well-dressed upper echelon society life, but also integrates the daughter he was given in the movie, and builds on his complex relationship with Batman. Ever since John Ostrander got his hands on the character, Deadshot has been one of the more fascinating and morally ambiguous members of the Squad, and this back-up tale does a lot to restore him to being a villain with a tortured conscience, whose motivations are rarely understood. It's also worth noting that the back-up story features operatives of Kobra, a recurring opponent of the Suicide Squad, and seems to be laying the groundwork for that villain to return in this run. At least, I hope that is the plan.